The Harris County Flood Control District presented to Harris County Commissioners Court Tuesday, Aug. 14, its final list of flood risk reduction projects that could be funded with the proceeds of $2.5 billion in bonds over a period of 10-15 years. Early voting on the bonds started Aug. 8 and continues through Tuesday, Aug. 21. The election is Saturday, Aug. 25. The $2.5 billion target is widely considered a small down payment on a $20-30 billion county-wide flood resiliency program that should emphasize buyouts, land acquisition and preservation, floodplain restoration and other non-structural approaches. The list of 237 projects includes 38 projects that were added as a result of community meetings held across Harris County in June, July and August, according to the district website. Note that the list of potential projects is not fixed or obligatory, and citizens should still have opportunities to influence future plans and priorities. Six additional projects were added through community input to the projects on Buffalo Bayou below Addicks and Barker dams. These include $30 million for design and construction of replacement bridges along Buffalo Bayou, apparently targeting bridges that went under water during Harvey or are thought to be obstructing the flow. The reference to “channel conveyance capacity around Beltway 8” and “potential high flow bypasses” reflects a simmering tension between residents on the straightened upstream of Beltway 8 and those on the meandering downstream. Neighborhood activists upstream of the beltway blame the “kinks” and “bottlenecks” downstream for causing flooding of their homes. Michael Huffmaster, president of the Briar Forest Super Neighborhood and chair of the Super Neighborhood Alliance, has been advocating a plan to cut through meanders downstream and install large underground concrete culverts to speed the flow. Some six miles of Buffalo Bayou below Barker Dam was rerouted, stripped, and straightened in the late Forties and Fifties by the Corps of Engineers through what is now Terry Hershey Park to several hundred feet below Beltway 8. Environmentalists, including Terry Hershey, Frank Smith, George Mitchell, and others, many of whom also lived on the bayou, led a popular movement in the Sixties and Seventies to stop the Corps from stripping, straightening, and concreting the bayou all the way to the Shepherd Bridge. As a result, much of Buffalo Bayou remains in a relatively natural, meandering state. 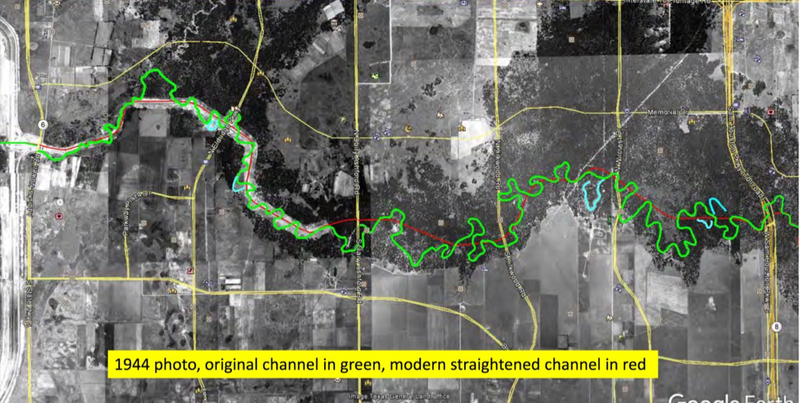 A comparison of the original meanders and the straightened channel of Buffalo Bayou flowing through Terry Hershey Park by geologist Tom Helm.